The original fate of this Vancouver Farmers Market radicchio was a salad, all chopped up. This leafy veg makes for the most beautiful lettuce with its strips of white and dark purply red! However, staring at my pot of fresh quinoa and the head of radicchio, I realized lettuce wraps could be fun. Since they’re so pretty and easy to eat, these make for a great appetizer, but also ideal for lunch or dinner. 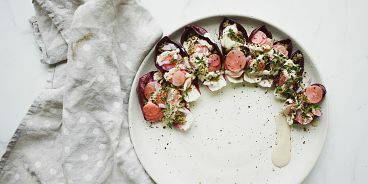 Fill radicchio leaves with cooked quinoa and garnish with radishes, onion, tahini drizzle, thyme and s&p. Easy peasy! !